A refreshing, tasty, enriching and minty Spearmint gum has the potential to turn over a new leaf on your dull depressing day. Just the aroma of Spearmint is not responsible for this revolution but this cool herb has enormous health benefits that energize your system and revitalize your brain functions. Scientifically known as Mentha spicata, this herb belongs to the mint family Lamiaceae. Spearmint is an excellent cooling diuretic that has the potent to reduce the heat in the body due to fever and inflammatory conditions. It’s proven pharmacological effects and enormous cooling values, gently cools the liver and protects from chronic health conditions like inflamed liver. Popularly known for its culinary and traditional medicinal uses, the essential oil extracted from the leaves of Spearmint plays a vital role in Ayurvedic medicine where this herb was locally known as Putiha and Pahari Putida. It has been in use for more than hundreds of years as a trusted carminative for treating digestive disorders, morning sickness in pregnant women and colic in infants. This herb and its essential oil has been used in almost all the oldest traditions of the world including Ayurvedic medicine, Biblical healing, Chinese medicine, Greek mythology and the European healing system. The antique cities of historical importance like Greece, Rome and Egypt have recorded the use of Spearmint as a natural fragrance agent for the body, digestive aid for treating gastrointestinal disorders, natural remedy for sexually transmitted diseases like gonorrhea, as a sedative for treating insomnia and other sleeping disorders, for treating bad breath and dandruff. The most popular use of Spearmint oil was that it was used in baths for its cooling and refreshing properties. Spearmint was used in the Ayurvedic healing system for treating fever, bronchitis, pain and other digestive ailments. The European medicinal practices made use of this herb for enhancing memory power and cognitive performance. Known as ‘Yerba Buena’ in the primordial Mexican culture, Spearmint was a natural remedy for handling menstrual cramps, vomiting, flatulence and indigestion. The milder effects of this herb made its use preferable for children than the Peppermint herb. 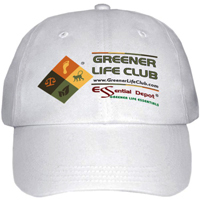 Biblical texts talk about the effectiveness of Spearmint for treating severe headaches. Spearmint is an important ingredient of the herbal tea known as ‘Zahraa’ according to the ancient Unani medicine. This tea is widely consumed in Syria and Damascus for its stimulating and uplifting values. A popular research by the Latin American medicine system proved that the Latino children had a stronger preference towards Spearmint than Peppermint and it was used as a natural expectorant for treating common cold and cough. The modern Western medicine also used Spearmint essential oil as a flavoring agent in chewing gums, candies, toothpaste, mouthwash, soaps, teeth whiteners and certain other personal hygiene products. This herb is also used in treating common cold, nasal congestion, motion sickness, influenza, irritable bowel syndrome, colic and few other respiratory problems. According to the Gas chromatography report, Spearmint essential oil constitutes of 3 chemical components that contribute to its unique fragrance, remedial properties and quality. 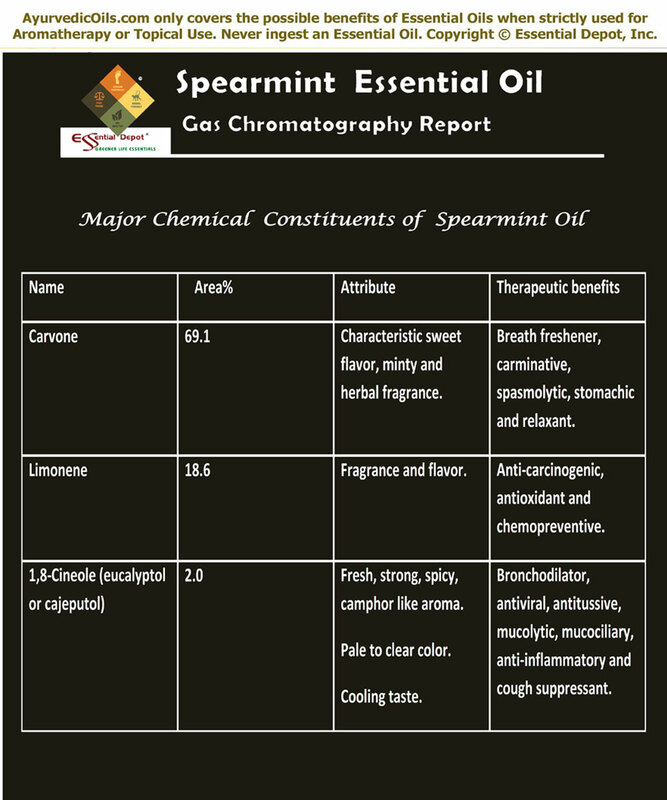 Spearmint oil is enriched with about 69.1% of Carvone constituent. 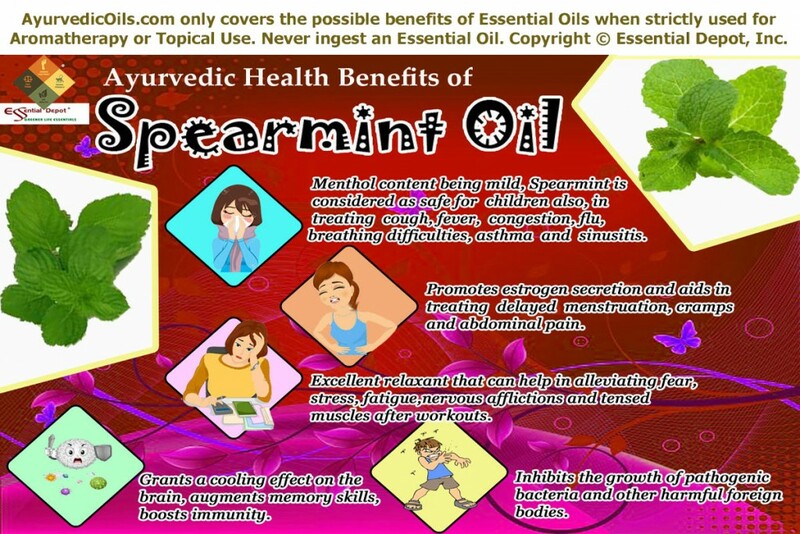 For learning more about the detailed information of these key constituents of Spearmint oil. The table below on the Gas Chromatography report talks about the principal chemical constituents and its role in granting the therapeutic and other attributes to Spearmint oil. This oil has antispasmodic, carminative, stimulant, antiseptic, emmenagogue, restorative, cephalic, decongestant, insecticide, disinfectant, diuretic, sedative, anesthetic and expectorant properties. Ayurveda is celebrated all over the world for its simple and easy to tag on medicinal practices. This spiritual healing methodology trusts that human body is a temple where the eternal spirit lives within. It is because of this trust Ayurvedic healing encompasses physical, emotional, social and spiritual wellness when dealing with the health of humanity. Every individual on this earth is unique according to Ayurveda and it strongly says that every one of us are made with a specific set of 3 vital energies known as doshas. The predominance of any one of these 3 doshas determines the physical balance, emotional stability and the behavioral traits of an individual. It is for this reason Ayurveda prescribes specific medications that is suitable for an individual and not for the illness as such. Ayurvedic physicians generally prescribe medications that are specific to the health condition and the unique individual constitution of a person. These remedies along with the disciplined Ayurvedic lifestyle practices aim at striking perfect balance between these doshas and with Nature. With its cooling and stimulating properties, Spearmint essential oil benefits the Pitta and Kapha predominant individuals. 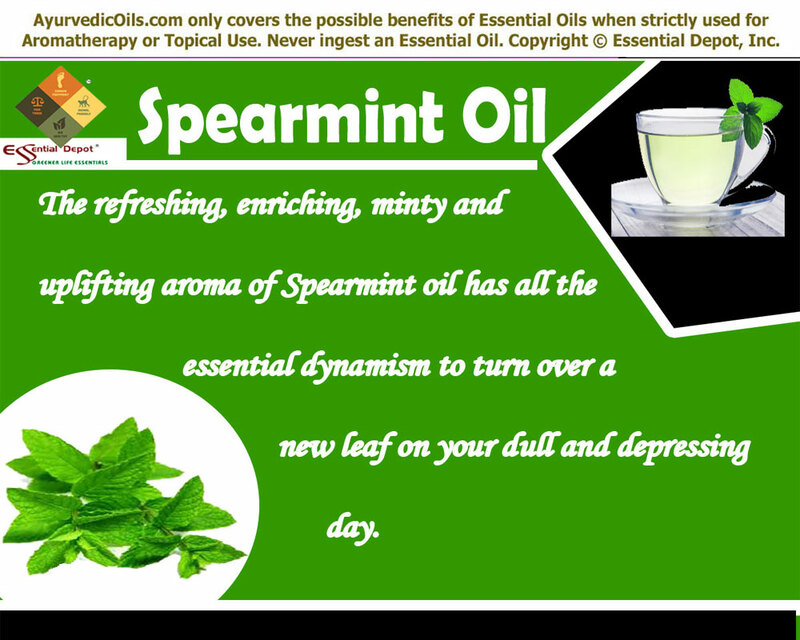 Spearmint oil has the power to pacify excess pitta that is responsible for body temperature, inflammatory conditions and heated emotions like anger, rage and irritation. With its febrifuge, spasmolytic, antitussive, diaphoretic, cough suppressant, antiviral, bronchodilator and anti-inflammatory properties, Spearmint is a champion oil in treating fever, chronic cough, chest congestion, breathing difficulties, bronchial congestion and headache. For its fever-reducing attribute, Spearmint is called as Jwarahara in Ayurveda. The antiviral properties of this oil assist in arresting the spreading of harmful viral organisms and preventing its growth, which is responsible for flu and fever. When compared to Peppermint oil, Spearmint oil has a lesser Menthol component and is considered safe for children as well. Inhaling the restorative aroma of this oil aids in opening the blocked nasal passages. Massaging your foot soles with 2 drops of Spearmint oil blended with 10 drops of coconut oil can assist in reducing the body temperature. Using 2 drops of this oil in steam inhalation is said to grant considerable relief from headache, nausea, nervous conditions, flu, fever, asthma, sinusitis, bronchitis, congestion, cough, migraines and breathing problems. For immediate relief from fatigue, fever and muscular pain, add 2 to 3 drops of Spearmint oil to your bath tub. This warm and soothing bath encourages relaxation, soothes your tensed muscles and nerves. The cooling and encouraging aroma of Spearmint can support in lessening fear, anxiety, fatigue, nervous afflictions and tensed muscles, especially after workouts. Spearmint oil has the power to promote the estrogen secretion and support in fostering delayed or blocked menses. Menstrual difficulties are often associated with hormonal fluctuations, especially the female hormone estrogen. With its abortifacient and emmenagogue properties, Spearmint oil does the magic for you by treating abdominal pains, menstrual cramps and blocked menstruation. A 2007 study on ‘Effect of Spearmint Teas on Androgen Levels in Women with Hirsutism’ have concluded that Spearmint can be a potent substitute anti-androgenic treatment in cases of mild Hirsutism. Massaging the affected parts with 4 drops of Spearmint essential oil blended with soothing carrier oils like Evening primrose oil can support in relaxing muscles after exercise, treating digestive disorders, expelling gas formed in the intestines and stomach, relieving from stress and fatigue, easing abdominal pain due to menstruation, improving concentration, relaxing contraction of muscles and nerves and in enhancing blood circulation. The diuretic property of this oil aids in cleansing the system by sending the toxic substances of the body through urine. The study on ‘Effect of Spearmint oil on inflammation, oxidative alteration and Nrf2 expression in lung tissue of COPD rats’ published in PubMed proved that Spearmint oil augments pulmonary inflammation and has a protective effect on lung injury in rats affected by chronic obstructive pulmonary disease (COPD). Whenever you feel like regaining your strength, enhancing your brain power and improving your memory skills, all you need to do is to 3 few drops of Spearmint essential oil with 1 drop of Rosemary oil to your diffusers or burners. Being a Medhya herb or one which has the power to nurture the functions of the brain, Spearmint oil can potentially uplift your spirits, grant a cooling effect on your brain, boost your immune power, normalize the metabolic functions and promote peaceful sleep with its encouraging and invigorating aroma. Spearmint oil can be termed as a Krimighna, which means effective remedy for destroying harmful microbes and Kusthaghna, an Ayurvedic remedy for healing wounds and treating various skin conditions. The antiseptic, disinfectant and antispasmodic properties of this oil aids in quicker healing of wounds and inhibit the growth of harmful organisms that are responsible for most of the skin problems. Adding few drops of Spearmint essential oil to your skin care cream or lotion will aid in treating scabies, itches, athlete’s foot, dermatitis, acne, syphilis, insect bites, wounds and skin ulcers. Diffused Spearmint oil can also be used in treating headache, spasms and as a rub in treating cold and cough. A 2001 study by the Central Laboratory, Lotte Company Ltd, Urawa, Saitama, Japan proved the effectiveness of Spearmint essential oil in inhibiting the growth of pathogenic bacteria with its potential antibacterial agents. A 2011 study on ‘Antifungal activity of Spearmint essential oil’ talks about its effectiveness in treating fungal infections. Spearmint oil is also an excellent oil for treating bad breath, vomiting, loss of appetite, gum problems, spasmodic cholera, ulcers and in treating excessive or unwanted hair growth in women. This original piece of information is meant only for the purpose of education and is not recommended to diagnose, prevent or to treat any medical conditions. It is neither meant to replace any prescribed medicines or the advice of a healthcare professional. We, the team of Essential Depot are not experts in Traditional medicine and these facts are shared only for unveiling the myths of Ayurveda and for spreading its glory in healing humanity across the globe. Essential oils are not recommended for internal use and remember to dilute essential oils in suitable carrier oils before using it for topical applications. This is because absolutely pure and organic essential oils are highly concentrated liquids and may cause allergic reactions, when used on the skin without dilution. Pregnant and nursing women, please excuse as Spearmint has abortifacient and emmenagogue properties and may end up in miscarriage. Speak with your Ayurvedic expert or medical professional before choosing the suitable essential oils as per your state of health and unique individual constitution. And the final friendly advice is to do a patch test on your skin before enjoying its complete benefits. 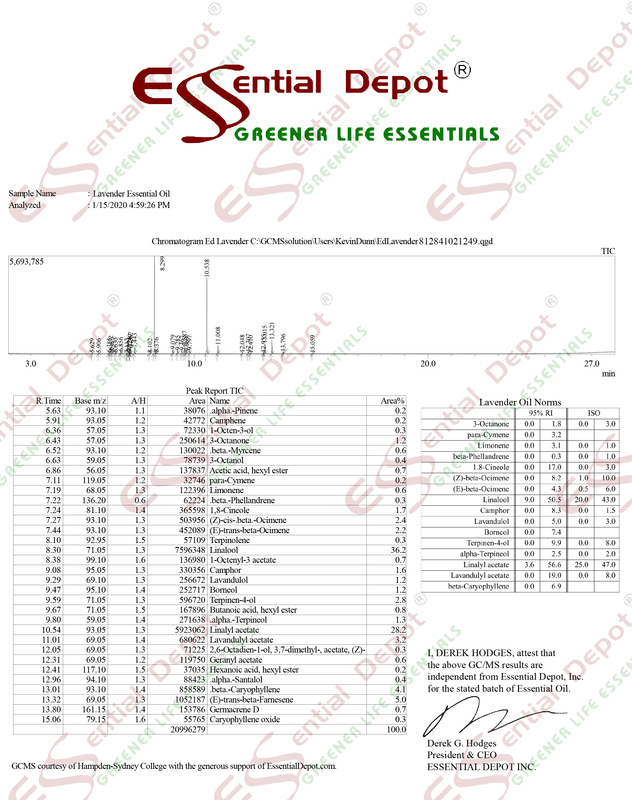 The MSDS (Material Safety Data Sheet) of Spearmint essential oil is readily available for your enhanced safety and healthier usage. 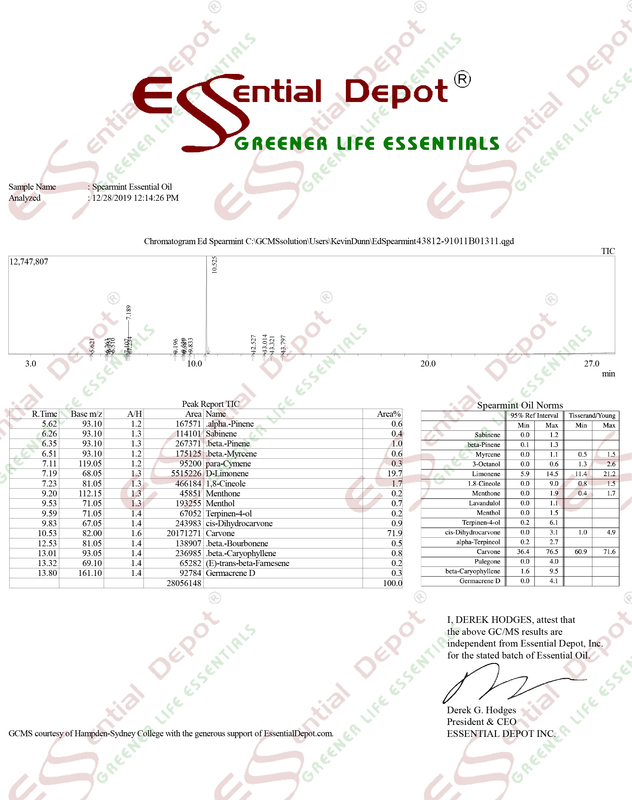 Gas Chromatography Report (GC) of Spearmint essential oil. Effect of Spearmint Teas on Androgen Levels in Women with Hirsutism, published in Wiley InterScience.